In 2007, the Intergovernmental Panel on Climate Change (IPCC) had estimated that the Arctic will have an ice-free summer by the end of this century. We might not have to live that long to see that happen as Peter Wadhams of Cambridge University (UK) has predicted ice-free summer in the Arctic in 2016. His prediction is based on projected data from the US National Snow and Ice Data Center (NSIDC). According to the provisional satellite data produced by the NSIDC, there was just over 11.1 million sq km of sea ice on June 1 as compared to the 30-year average of 12.7 million sq km The difference of more than 1.5 million sq km is more than four times the size of Germany. When Wadhams predicted ice-free summer in the Arctic, he meant less than one million square kilometers of sea ice in the Arctic Ocean – which means 90 per cent shrinkage in ice cap over a period of three months. The world had received a rude awakening in 2011 when the NSIDC data revealed that ice caps covered just 4.33 million sq km of the Arctic Ocean in September. A year later, the mid-September reading in 2012 measured 3.4 million sq km. Four years down the line, we are looking at a scenario where less than one million square kilometres of sea ice is a possibility. Why is 2016 worst so far? Some climatologists and researchers are sceptical about Wadham’s predictions. However, that doesn’t nullify the fact that all the indications were pointing to a worst summer this year. The Arctic sea ice extent set a record low in March 2016. On March 24, Arctic sea ice extent was recorded at 14.52 million sq km, a record low ever since satellite observations started in 1979. The sea ice extent is melting faster than at the same time of the year in 2012. Last Year, Down To Earth reported the growing enthusiasm among scientists to understand the reason behind thinning of ice layer and far-reaching consequences on climate change. This year, fractures in the ice cover became evident in the north of Greenland as early as May. Mark Serreze, the Director of the NSIDC, thinks fractures are "quite unusual" at this time of the year. Satellite images show the fracturing of sea ice is more prominent in the Beaufort Sea, north of Alaska, where the ice is rapidly breaking up. This fracturing, according to Serrezze, is "a sign of much thinner ice in the region that is typically the thickest and most durable". Another fact that seems to defend Wadham’s arguments is the emergence of “unusually thin and even totally absent” sea ice covers on both the Atlantic and Pacific sides of the Arctic. A team of researchers at Rutgers University has been harping on the concept of “Arctic amplification”. It refers to the enhanced sensitivity of high latitudes to global warming. 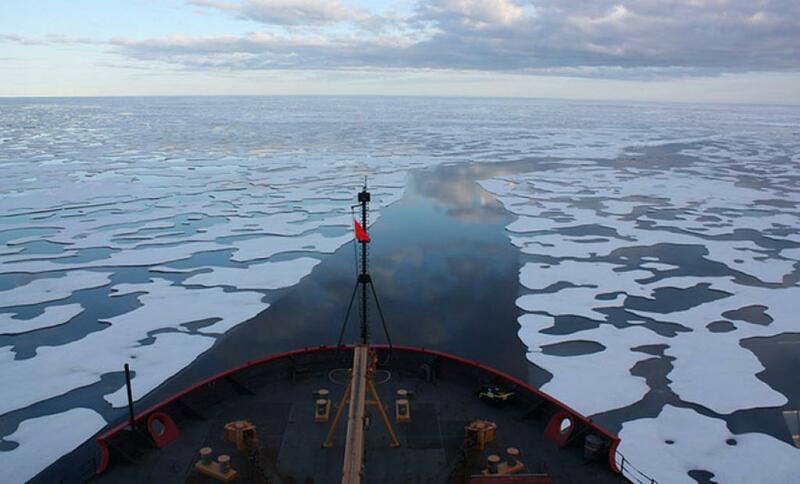 Declining sea ice is one of the contributing factors to this phenomenon. Extreme weather in Western Europe and large swathes of North America is attributed to Arctic amplification. According to climatologists, changes in the jet streams, especially polar jet streams, are also linked to global warming. Jet streams are ribbon of strong winds blowing high above in the atmosphere and exerting huge influence on weather patterns. When the jet streams are warmer, their ups and downs become more extreme, bringing different weather to areas unaccustomed to climate variations. They bring prolonged cold weather and snowfall to some places and extended summer with unusually hot conditions to others. It explains the occurrence of massive snowstorms and bone-chilling cold on the east coast of the US and flooding in Britain. With the warming of the Arctic and the loss of sea ice, scientists have observed that methane – a greenhouse gas – has started to bubble up to the surface at a precariously faster rate. Generally, it lies frozen on the sea bed. One can’t be oblivious to another major concern: having less sea ice would lead to higher absorption of the sun's energy as the surface of the earth gets darker. Species like polar bears, seals and walruses depend on sea ice cover to breed, hunt and rest. The depleting sea ice causes malnutrition in them and their already declining population sees a further southward trend. According to Andrew Freedman, the Science Editor at Mashable, dwindling sea ice cover has forced walruses to undertake a journey of hundreds of miles for food. That’s precisely why tens of thousands of them are increasingly seen on beaches in Alaska and Russia. They come here in search of rest. The polar bears use sea ice in the Arctic as a hunting ground for seals. However, they are experiencing weight loss in recent years as they have 30 less days every year to hunt on the ice. According to a new NASA study published on an April 2016 paper in Remote Sensing of Environment, Arctic regions of North America are losing their white patches and getting greener. Almost one-third of the land cover resembles landscapes found in warmer climes. The images captured by Landsat satellites reveal a healthy growth of vegetation on the ground. The researchers are of the opinion that Quebec (Canada), western Alaska other regions became lot greener between 1984 and 2012. Rising temperatures in the Arctic has made the region conducive for plants to grow and led to the changes in the soils. Grassy tundra is changing to shrubland and shrubs are growing bigger and denser. The images suggested extensive greening in the tundra region of western Alaska, the tundra region of Quebec and Labrador and the northern coast of Canada. Hence, the rapid loss of Arctic ice is not only spelling disaster for the Arctic species but also scripting a drastic shift in climatic patterns that the world is not yet ready to tackle.